This book is a great resource, though it isn’t quite what I’d expected or hoped for. Matyszak writes with his usual felicity and accessibility, but this book is not, as the title and cover might led you to believe, quite so similar to his Legionary or Gladiator. The premise does not really drop you into the role of ancient tourist. 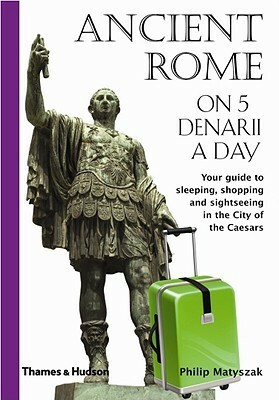 Rather, the book provides a snapshot view of Rome-at-a-glance, somewhere around the year 200. And it just that — a glance view, with plenty of anecdotes and trivia, but not a particularly deep exploration. I do like the book’s organization, which takes you through things to do, places to go, and social customs to observe. Matyszak pays special attention to the geography of the city of the Caesars: what’s on which hill (temples, temples, and, oh yeah, some more temples), what you’ll find in the Subura (crime and prostitutes, mostly), what’s across the river (nothing you want to be a part of), which forums to hit for what activities and shopping excursions. He stresses a lot of the activities most important to Roman social life at all strata — bathing, eating, gossiping, going to the races. Roman entertainment can be beautifully poetic or utterly depraved, though Matyszak does unpack the goings-on at the Colosseum — not always lethal combat between gladiators (who were, after all, expensive investments), not necessarily to everyone’s taste (Romans throughout the centuries voiced their distaste for the more gruesome activities — though enough still approved, clearly, that they kept it up), and Christians pretty much never got thrown to the lions (they got crucified instead, because that’s the Roman sense of humor there in a nutshell). He notes the architectural genius of the colosseum, able to fill in 20 minutes and disperse as quickly, using techniques that stadium-builders still employ today. Though the humor in Ancient Rome in 5 Denarii a Day is not as laugh-out-loud funny as I found Legionary to be, or even the Classical Compendium, Matyszak’s sly humor still shines through periodically. Some of the best bits of the book, though, actually showcase the humor of the ancients, every bit as dry and ironic as the best of the BBC. Matyszak liberally sprinkles the book with quotes from Plautus, Cicero, Tacitus, Plutarch, and others — and even when those are from “serious” sources, they often highlight the absurdity of social or political life. They also provide insight into those great geological details about what sort of people you’d find in what places. Overall, this is a nice resource to have — not particularly comprehensive, but an excellent overview, and certainly inspirational for me. There are all sorts of fun tidbits to mine and to research further. This would be a great addition to any Rome-enthusiast’s bookshelf.